RAFFLES! PRIZES! FOOD! CONTESTS! FUN! Join us for lots of fun and a worthy cause! $200.00 minimum per team but the sky’s the limit! Organize a team of 4-5 of your friends, co-workers, classmates, family, or neighbors (including at least 1 adult). No bowling experience is necessary! You can get started right away with picking your team, selecting a team name, and signing up. The minimum fundraising goal is $200 per team. You can either donate this as a team or ask your friends, co-workers, and family to donate to the Foundation. This $200 contribution covers the cost of bowling, shoe rental, a cool t-shirt, and includes a donation to support the cause. Any fundraising above $200 goes directly to support the Small Victories Foundation’s efforts to provide creative experiences to brain injury survivors. Choose a name for your team. This is a chance to be creative and have fun! We’ll have a prize for the best team name. You can direct your sponsors to www.bowlathon.net to make their donations on behalf of your team with a credit or debit card through PayPal. The website will keep track of your progress and you’ll be notified by e-mail when your team receives a donation. Sponsorship donations can also be made by cash or check. Checks should be made out to “Small Victories Foundation” and these donations can be recorded on the paper sponsor form that you can DOWNLOAD HERE. If you are collecting cash donations, please keep track of these contributions carefully on your sponsorship form. The Foundation wants to thank all of your sponsors and provide them with tax acknowledgement letters, and can only do that if the total amount of cash listed on your form matches the donations turned in at the event. Team Captains – please make sure all of your teammates know the date, time and location of the event. Bowling will begin at 12:30 pm. The event runs until 2:30, though you’re welcome to stay and play extra games if you arrange payment to Dart Bowl. Please arrive around 12:00 pm to check in, get your shoes, and get any special instructions. Don’t forget your socks! Living on a Spare is the best thing I've ever heard. For Team: The Cain Team Dudes! 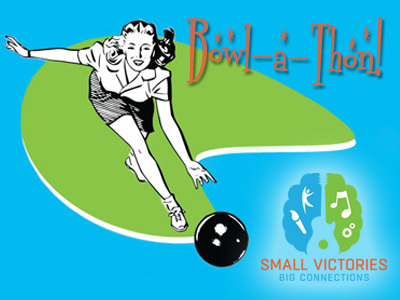 Become a Small Victories Bowl-a-thon Sponsor! Why become a Bowl-a-thon sponsor? Sponsoring a Small Victories Foundation client is one of the best ways you can help us carry out our mission to challenge and support adults with traumatic brain injuries! At the same time, it provides a recognition opportunity for you, your family and friends. Your donation is 100% tax deductible and provides the Foundation with essential art/music supply and tuition funds, while providing you with an opportunity to advertise your business in the community. Each sponsor will have their name or company name/logo and personal message appear on all publications (Facebook page, Website, Newsletter, Event Publications) Sponsors will also receive a very soft Small Victories Foundation T-Shirt! If you are interested in becoming a Small Victories Bowl-a-thon sponsor please contact us today! One team (5 players per team) to bowl at event for your company. Your company featured on SVF’s events webpage and tournament registration website with your logo and a link to your website. Your company acknowledged and thanked in all pre- and post-event media. Three teams (5 players per team) to bowl at event for your company. Your logo featured on day-of event signage and collateral (welcome signs, event banners, event schedules, etc.). Your logo featured on the tournament t-shirt. Five teams (5 players per team) to bowl at event for your company. Your company’s logo featured on all Small Victories Foundation publications such as the newsletter, website, and Small Victories Showcase events for an entire year. Mission: The mission of the Small Victories Foundation is to challenge and support adults with traumatic brain injuries by providing a post-therapy educational experience in the arts. Vision: Our vision is that the voice of every person with a brain injury is heard and appreciated through his or her creative expression. Because traumatic brain injury sets in motion a lifetime of recovery and adaptation, the Small Victories Foundation exists to help adults with TBI advance their emotional and physical healing by providing opportunities to learn artistic expression. Research demonstrates that learning and appreciating music and varieties of art helps form new pathways in the brain. These new pathways have effects far beyond the task at hand, and have positive impact on our lives in whole. Our passion is tied to the idea that after the ICU, after the inpatient rehab, after the day care and outpatient therapy, and after the insurance companies have stopped funding recovery, there is still work to do. Regardless of whether the person with a TBI has been taught to perform a new (and likely lesser) job, he or she still has an innate human need to feed the soul with beauty and the satisfaction of personal creation. 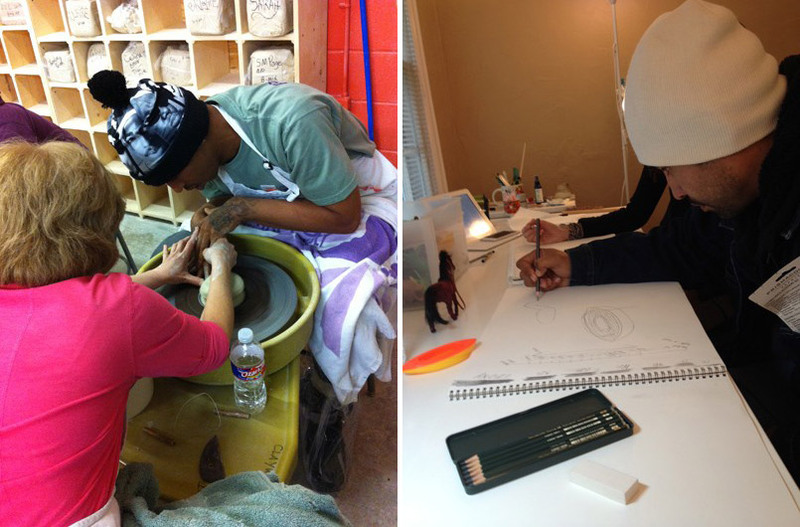 We provide scholarships and professional instruction for our clients with TBI to learn to play instruments, write, dance, sculpt, paint, weave, form, build–create works that they, their families, and their communities can appreciate. We believe that the act of creation uplifts the soul, and facilitates a peaceful mind, and we are moved to encourage this sharing! Help us spread the word! For more information, visit our website at www.smallvictoriesfoundation.org.